We are going crazy and we want you to come with us! Fiber on a Whim ...."FOR ALL YOUR SURFACE DESIGN AND EMBELLISHMENT NEEDS! FABRIC, PAINTS, DYES, THREAD, BEADS, BUTTONS.....". We love experimenting with paints, dyes, and other surface design techniques. We also love creating a 3D piece of artwork with embellishments. Our view is that any object not bolted down or already attached to something else can be used to create dimension, whether by stamping, creating a silk screen, embellishment or more. Our main mission is that we hope to inspire you to try these new surface design and embellishing techniques or simply to expound on your current use. Providing excellent customer service while doing this is a high priority. We hope to bring a smile to your day through the website or through use of our products. As everyone knows, we take life way too seriously, this is no dress rehearsal. So have fun and enjoy yourself! A little about us other than the fact we are going crazy is that we are a mother/daughter duo. 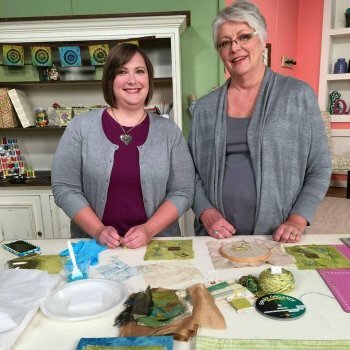 The mother, Janelle (Jan) Girod, got into the fiber arts world in 1976 and has slowly but surely brought the daughter, Kristin Rodriguez, along for the ride. Sometimes it was with Kristin kicking and screaming. Jan is truely a fiber artist whether it be with fabric, yarn, thread, or paper. Kristin has now found herself fully in the quilting world.